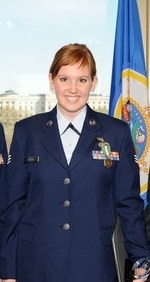 Allison Niebauer is a 2008 Fellow from the United States who participated in the Germany program. She is a former Air Force Staff Sergeant and currently works as The Refugee Health Care Services Team Lead at a large refugee resettlement agency in Wheaton, IL. She is passionate about post-conflict reconstruction and loves working with refugee communities here in the United States. She is also passionate about health care access for vulnerable communities and works to overcome systemic barriers within the US medical system to accessing care.